Striking double lilac flowers laced in ice-white. New for 2018, a fabulous bicolour with lilac flowers laced with ice-white. Easy to grow, the compact, vigorous offer unrivalled performance. Masses of large, fully double flowers. Fully winter hardy and flowers up to mid-May. Supplied as 3 Jumbo Plugs ready to be potted up and grown on. 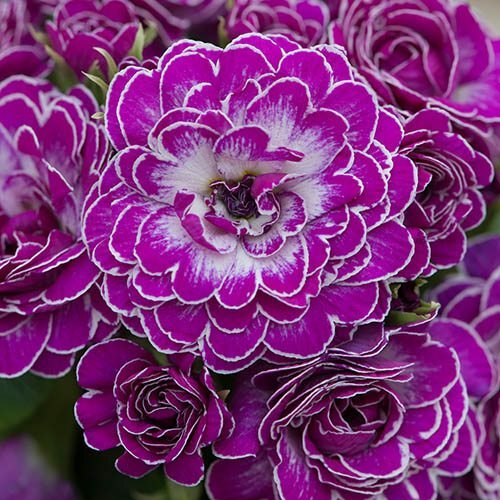 New for 2018, this eye-catching double primrose Belarina 'Candy Frost' is a refined, extra-large flowered bicolour with lilac blooms edged in ice-white lacing. Easy to grow and with unrivalled performance, this compact primrose is fully winter-hardy and flowers up to mid-May with masses of large flowers up to 3-5.5cm (1.2-2in) held on upright stems. The flowers remain fully double like miniature roses and a unique green ruff highlights the flower colour further - a truly outstanding spectacle.